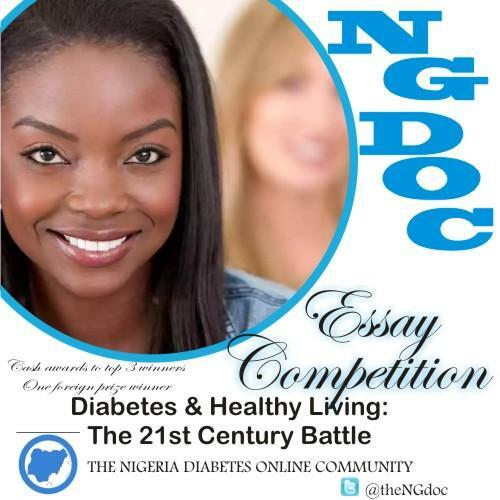 “DIABETES & HEALTHY LIVING: “THE 21st CENTURY BATTLE”. This essay aims at assessing and improving people’s knowledge of diabetes and having a healthy lifestyle and the interaction that exists with both. 1. To qualify participants must follow @theNGdoc and like our Facebook page. 7. The essay could be in any format i.e. can be in form of a story, poem, etc. 8. The essays would be assessed for creativity and originality. Winners will be rewarded on the World Diabetes Day event. Goodluck. can a student who study abroad but a Nigerian participate? Pls feel free to participate. We look forward to receiving your essay. Is this an online competition.Can even Indians participate in this competition.Does this competition cost any?.Is there any limited eligibility?.I am a school student studying class 10.Am I eligible for this?. Yes it is open to international participants.